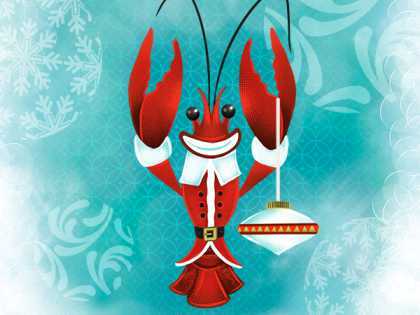 The heart of Cajun & Creole Country, Lafayette, LA, is transformed into a winter wonderland throughout the months of November and December with a Cajun and Creole Christmas. From light shows to parades, tour of homes, performances, carolers and much more you can be sure to find something to get the family in the holiday spirit. If you enjoy riding around admiring homes decorated for Christmas be sure to check out LafayetteLights.com, a website and app that provides a map of decorated homes that even lets you vote on your favorites. Below, you will find a list of events and activities both in Lafayette and the surrounding areas. Don&apos;t see your event listed? Just click here to let us know and we&apos;ll be sure to add it! November 18 - Country Christmas. Sugar Mill Pond Town Center, Youngsville. 1–3 p.m. Ring in the holiday season with free photos with Santa printed onsite, train rides, fun jumps, live music, arts and crafts, and of course a traditional favorite – roasted marshmallows. 337-856-2323, SugarMillPond.com. November 21 - Downtown Alive! Official Lighting of the City Tree. Parc Sans Souci, 201 E. Vermillion St., Lafayette. 5:30 -8:30 p.m. Free. Join the Pine Leaf Boys for a special Thanksgiving Eve Holiday celebration at Downtown Alive! where Mayor-President Joel Robideaux will light the official city Christmas tree! 337-291-5566, DowntownLafayette.org. November 23-24, 30 December 7-30 - Safari of Lights. Zoo of Acadiana, Broussard. 5-9 p.m. 3 years old and above $7. Stroll the glistening pathways of the Zoo at night as Christmas music fills the air putting you in the spirit of the holidays. View still and animated lighted animal figurines, North Pole Express train ride, hot cocoa or hot cappuccino at the Elves Eatery. 337-837-4325, Zoosiana.com. November 28 - Noël en Broussard. City Hall, Broussard. Join the city of Broussard for the lighting of their 25-foot Christmas tree. The reception and tree lighting will begin at 5:30–8 p.m. 337-837-6001. November 30-December 23 - Noël Acadien Au Village. Acadian Village, Lafayette. 5:30-9 p.m. $10 at the gate; $8 in advance. Festival fundraiser with half a million lights, displays, food, entertainment, and holiday shopping. 337-981-2364, AcadianVillage.org. November 30 - Festival of Light. Oil Center, Lafayette. 5–9 p.m. Celebrate as the switch is pulled to light the colossal Santa, sleigh and reindeer over Coolidge Blvd. Enjoy music, food and fun, and of course shopping! For children of all ages…Santa will be on hand to take pictures. Behold the living Nativity and enjoy an outdoor snow yard. You do not want to miss Lafayette’s most loved holiday tradition. 337-232-1267, TheOilCenter.com. December 1-31 - Christmas at the Alexandre Mouton House. 1122 Lafayette St., Lafayette. Tues.-Sat. 10 a.m.–4 p.m. $5 Adults, $3 Seniors, $2 Students. The Alexandre Mouton House will be decorated for Christmas with period decorations. 337-234-2208. December 2 - Sonic Drive-In Christmas Parade. Downtown to the Oil Center, Lafayette. 1 p.m. Free. One of the oldest Christmas activities in Acadiana. Parade features over 20 floats, high school marching bands and the official arrival of Santa Claus to Lafayette. 337-988-5301. December 5 - Christmas in Scott. La Maison de Begnaud St. Aubin Park, Scott. 5–8 p.m. Free. Farmer’s Market opens for shopping. Celebration. Come and join us for the official lighting of our Christmas tree and a visit/photo op with Santa Clause. This is the perfect event to put you in the Christmas Spirit and enjoy great entertainment. 337-269-5155, CityOfScott.org. December 7-9 - Living Bethlehem. Sugar Mill Pond Town Center, 120 Waterview Rd., Youngsville. 7–8 p.m. Free. The Living Bethlehem is a live nativity drama, held outdoors at Sugar Mill Pond and features a cast of children, live animals and a children’s choir. 337-856-2323, SugarMillPond.com. December 9 - City of Broussard Christmas Parade. Begins at the intersection of S. Morgan down Albertsons Pkwy. 1 p.m. 337-837-6681. December 9 - Lessons & Carols. St. John Cathedral, 914 Saint John St., Lafayette. 7:30 p.m. Free. Traditional candlelight service of readings and choral music for the Christmas season in the beautiful ambiance of St. John Cathedral. 337-232-1322, SaintJohnCathedral.org. December 12-23 - Old-Time Christmas at Vermilionville. 300 Fisher Rd., Lafayette. 10 a.m.–4 p.m. daily. (Family Day-Dec. 16) Regular admission $10 adults, $8 seniors, $6 students and children 6 & under enter free. Group rates available. Experience the simple warmth and beauty of Christmas past as our historic village brings to life the holiday traditions of yesteryear. You can meet Papa Noël, learn how to make wax candles, sing along to Christmas carols, watch popcorn stringing and even get a taste of apple cider! Perfect for student field trips. 337-233-4077, Vermilionville.org. December 14 - Home for Christmas. Heymann Performing Arts Center, 1373 S. College Rd., Lafayette. 7 p.m. Admission. Acadiana Symphony Orchestra’s annual Christmas concert celebrates the magic of the season with Lauren Daigle. 337-232-4277 ext. 1, AcadianaSymphony.org. December 15 - Christmas at Couret. Couret Farms, Bourdette Drive at Abilene Lane, Lafayette. 6 p.m. Live music by Ray Boudreaux, pictures with Santa, Children&apos;s activities, local vendors, and more. December 31 - New Year’s Noon Carnival & Countdown. Children’s Museum of Acadiana, Lafayette. 10 a.m.–2 p.m. Ring in the New Year at the stroke of noon with fun for the whole family. 337-232-8500, ChildrensMuseumOfAcadiana.com. November 24 - Grand Noel. Downtown Grand Coteau. 4–8 p.m. Start your Christmas shopping with a visit to the streets of historical Grand Coteau. There will be a blessing of the life-size nativity scene on display. The gift shops will be open for your convenience offering refreshments and unique gift items. Enjoy holiday traditions including carriage rides, live music at various locations and photos with Santa. Popular food trucks will be on hand offering their specialties. Bring the entire family for a memorable evening. 337-945-4314, CajunTravel.com. December 7 - Annual Lighting of the Village. 828 E. Landry St., Opelousas. 5-8:30 p.m. Free. The annual lighting of the historic Le Vieux Village celebrates the season with children’s activities, Christmas carols and a visit from Papa Noël! 800-424-5442, CityOfOpelousas.com. December 7-8 - Christmas at Coteau. Schools of the Sacred Heart, Grand Coteau. This year’s schedule of events includes the Holiday Market, Coteau Café, the Friday gourmet luncheon, Cookies at Coteau, Eat Drink & Be Merry Saturday Luncheon. You can also enjoy the Sounds of Coteau, where the lower school students perform Christmas music at 10:15 a.m. and 2:15 p.m. in the chapel. SSHCoteau.org. December 8 - Christmas Choir Concert. St. John’s Episcopal Church, 308 Church St., Washington. Get a little Christmas cheer from one of the few early music ensembles in the state of Louisiana, the Baton Rouge Early Vocal Ensemble. 337-826-7337, CajunTravel.com. December 13-14 - Eunice Community Concert Band & Choir Christmas Concert. 7 p.m. Liberty Center for the Performing Arts, 200 Park Ave., Eunice. Eunice Community Concert Band & Choir presents the 2018 Christmas concert and includes a variety of styles. This family-friendly event is designed to get everyone in the holiday mood. 337-457-1776, ECCBC.org. December 13 - Children’s Christmas Parade. The annual holiday event features colorfully lit Christmas themed floats, marching bands, costumed characters and of course everyone’s favorite, Santa Claus! The parade begins at 6 p.m. at St. Landry Catholic Church on Union and Main Street, rolls through downtown Opelousas and ends on Creswell Lane. 800-424-5442, CityOfOpelousas.com. November 23 - Breaux Bridge Official Lighting of the Christmas Tree. Farmers Merchants Bank & Trust, 100 S. Main St, Breaux Bridge. Santa will be there to help start our holiday season by officially lighting the Christmas Tree on top of FM Bank in downtown Breaux Bridge. Performances by Brazos Huval School of Music, Yvette Landry and Friends and entertainment from local dance teams, Coca-Cola truck photo opportunities for the family and more! Events begin at 4 p.m. BreauxBridgeLA.net. November 25 - Breaux Bridge Christmas Parade. Downtown Main Street. 2 p.m. The Bayou comes to life with the holiday spirit with floats, live entertainment and caroling. The parade will start at the Armory Hall on Bridge Street turning on Rees Street and ending on Refinery Road. For more information call the Bayou Teche Visitors Center at 337-332-8500. December 2 - Tour of Homes. St. Martin de Tours Church Square, St. Martinville. 337-394-2235, StMartinville.org/Festivals.html. December 9 - St Martin de Tours Lighting of the Square. St. Martin de Tours Church Square, St. Martinville. 337-394-2235, StMartinville.org/Festivals.html. December 15 - Supper on the Square. St. Martin de Tours Church Square, St. Martinville. Stroll around the historic square stopping at numerous historic sites to enjoy a taste of some of the best cajun and creole food in Acadiana. 337-394-2235, StMartinville.org/Festivals.html. December 1-31 - Window Wonderland. Main Street, Historic Downtown, New Iberia. 9 a.m.–9 p.m. Storefront windows on New Iberia&apos;s Historic Main Street play host to festive Holiday Magic on Main themes through the merry season. 337-378-9469, IberiaTravel.com. November 24 - Let it Sneaux Holiday Festival. Isle of Iberia RV Resort, 911 N.W. Bypass (Hwy. 3212), New Iberia. 10–6 p.m. Craft show, live entertainment, holiday festival activities for families and lots more. (337) 365-6197, IberiaTravel.com. November 25 - Sounds of the Season with the Acadiana Symphony Orchestra. St. Peter&apos;s Catholic Church, 108 E. Saint Peter St., New Iberia. 3–4:30 p.m. Free Christmas concert featuring familiar Christmas songs as well as classical selections. 337-364-1603, IberiaCultural.org. December 1-31 - Victorian Christmas at the Joseph Jefferson Home. Rip Van Winkle Gardens of Jefferson Island, New Iberia. 9 a.m.-4 p.m. Admission. Tours of the Joseph Jefferson Home and Rip Van Winkle Gardens decorated for the Holiday Season. 337-359-8525, RipVanWinkleGardens.org. December 3-29 - Shadows Merry Making Season. Shadows-on-the-Teche, New Iberia. Mon.-Sat. 10 a.m.-4 p.m. Admission. Tours of Shadows-on-the-Teche Plantation & Gardens decorated for the holiday season. 337-369-6446, ShadowsOnTheTeche.org. December 8 - Delcambre Christmas Boat Parade. Delcambre Docks. 411 S. Richard St. 7 a.m.-9 p.m. Fun for the whole family as you watch lighted boats of all sizes cruise Bayou Carlin while listening to Christmas music. 337-658-2422. December 8 - Very Berry Christmas Quest. Greater Iberia Chamber of Commerce, 111 West Main Street, New Iberia. Family scavenger hunt with activities throughout the day and prize drawings. 337-364-1836, IberiaTravel.com. December 8 - Magic on Main Christmas Parade. Main Street, New Iberia. 7 a.m.–8 p.m. Events throughout the day, including a Christmas themed breakfast, craft vendors, food trucks, musical performances and lighting of the Community Christmas Tree. There will be a cutest PJ contest and winners will ride in the parade on the Santa float. Magic on Main Christmas Parade with Santa Claus, marching bands and dance groups at 6 p.m. 337-207-5670, IberiaTravel.com. December 9 - Delcambre Main Street Christmas Parade. Main Street, Delcambre. 2-4 p.m. Parade begins at corner of Main Street & S. Pelloat to Delcambre Shrimp Festival Bldg. 337-519-2541, IberiaTravel.com. December 14-16 - Southern Sleigh Rides. Sliman Theatre, 129 E. Main St. New Iberia. 5:30-9 p.m. Sleigh rides in historic downtown New Iberia with food & drinks available for purchase. Family fun. $25 per ticket/ presale only. 337-207-5670, IberiaTravel.com. December 21 - Hugo Kringle. Iberia Parish Library, 445 E. Main St., New Iberia. Mike Anderson better known as Hugo Kringle sings Christmas songs and tells stories of growing up with the boy who would become Santa Claus. 337-364-7150, IberiaTravel.com. December 5 - Christmas in Crowley. Historic Downtown, Parkerson Ave., Crowley. 6-8 p.m. Over 200,000 dazzling animated holiday lights synchronized to music. Tune your radio to 93.3 FM and listen to the lights! 337-783-0824 ext. 301. November 24-December 31 - Kemper Williams Park Christmas Lights in the Park. 264 Cotten Rd., Patterson. Sun.-Thurs. 5-9 p.m.; Fri.-Sat. 5-10 p.m. $2 per car. Enjoy the beautiful displays, lights and music throughout the park as you ride and gaze upon the Christmas Nights and Holiday Lights. 985-395-2298, CajunCoast.com. November 25 - City of Patterson’s Annual Lighting of the Christmas Tree. Morey Park, Main Street Hwy. 182 Downtown Historic District Patterson. 985-395-5205, CajunCoast.com. December 1-31 - Victorian Christmas at Grevemberg House Museum. 407 Sterling Rd., Franklin. 10 a.m.-4 p.m. Adults $10, Seniors & Students $8, Children 12 and under $5. Grevemberg House Museum will be decorated in the Victorian fashion with toys and dolls, Christmas tree, garlands and floral arrangements. 337-828-2092, CajunCoast.com. December 1-31 - Christmas on the Cajun Coast. Various locations in St. Mary Parish. Elegant antebellum homes decked in Victorian holiday finery, boulevards of live oaks twinkling with white lights, traditional holiday performances, and Christmas parades. 985-380-8224, CajunCoast.com. December 10-31 - Tour of Oaklawn Manor. 3296 E. Oaklawn Dr., Franklin. Tues.-Sun. 10 a.m.-4 p.m. Adults $15, Students $10. Each room of the home is beautifully decorated with trees and themes of the holiday season. 337-828-0434, CajunCoast.com. December 6 - Abbeville’s Annual Christmas Stroll. Downtown Abbeville. 5:30-8 p.m. Free. Enjoy the sights and sounds of Christmas as local merchants open their businesses for holiday shopping, festivities and more. 337-898-4110, MostCajun.com. December 9 - Abbeville’s Christmas Parade. Downtown, Abbeville. Free. Enjoy floats decorated for Christmas, marching bands playing holiday favorites and an appearance by Santa Claus. 337-652-0646, MostCajun.com.